After two great games of civil war against other High Elf armies it was time to face one of the archenemies - Warriors of Chaos. 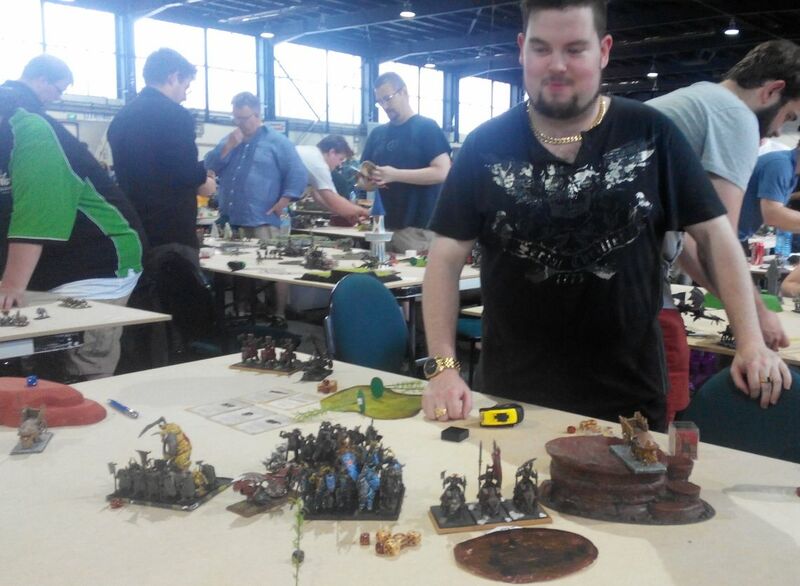 I had a great pleasure to play for the very first time against Chris and his legion of steel. We also played Meeting Engagement scenario. I find it always interesting as it may influence the deployment but not only in a negative way (when your war machines end up in reserves for instance) but also in a positive manner (when you have some fast units as reinforcements). It also creates more choices to be made, in particular for the player who wins the roll off and has to pick one from four possible deployment zones. Personally, I prefer to lose that roll off and deploy when the enemy is already arrayed for battle, as that allows me to counter some threats better. On the other hand, with the diagonal deployment and against combat orientated armies like WoC, the distance between the armies can be shorter for my liking. Sorcerer General - Not a popular choice for a leader as his Ld8 does not help regular troops much. But he is useful regardless, he is well protected and Scroll of Shielding can be surprisingly effective, especially in the combination with Mark of Tzeentch. This sorcerer does not have it so he potentially can join any unit as Marks prevent characters from joining regiments that are dedicated to another chaotic deity. The good thing for me here (and that applies to all characters) is that he is vulnerable to Spirit Leach due to Ld8 and only 2W. It is also possible to get him in combat with enough attacks but that is risky idea as his bodyguards will be dangerous enough to rather avoid one on one confrontation. Metal magic is a very good lore and it adds to the variety of tools this army has. BSB - mandatory character in all armies in my opinion, here he is even more needed due to Ld8 and many frenzied units around. With 2+ armor and 5++ ward he is better protected than the general. Amulet is also very helpful here, in particular for that unlucky Look Out Sir! roll. He can hit hard too with his flail although that slightly reduces his armor as he cannot use the shield. Again, good character but not as tough as WoC can be! Slaanesh Sorcerer - much faster wizard, with his marauders he can attempt vanguard and then move further behind enemy lines and cast very dangerous Choir. I have seen it done before and I needed to take some precautions as bubble version can easily nuke half of my army. Nurgle Warriors - the usual suspects, hard to hit, tough and hard hitting too, these guys are better not engaged from the front. And they need to be attacked from the flanks preferably too. The good thing is they are slow and it will take them a little longer to reach my lines. Marauders - designated bodyguards for the sorcerer, they are going to protect him to the last. With fast cavalry ability they will be very hard to catch but if I can cast a few fireballs at them they might melt quickly. 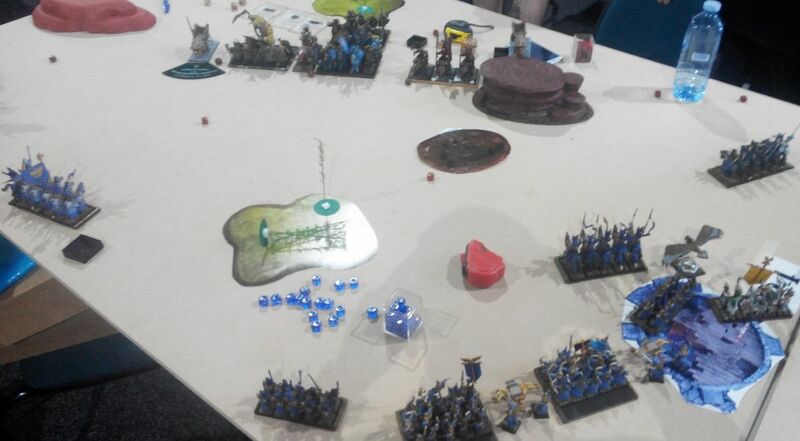 Very good target for my shooting but I expect them to stay away from the open space unless Chris decides to go for some gamble and move them forward to cast some deadly spell. Chariot - these are always a problem for my army and with T5 and 3+ armor I really wish I had some sisters of avelorn with me. They can take surprisingly lot of punishment and still have the same hitting potential. Mark of Khorne makes them even more dangerous as two charioteers pack 6A with S5! So even charged it can hit back. Potential target for bolt throwers and searing doom. Knights - not as popular as long time ago, still very good unit. These have mark of Tzeentch and are obviously character bunker. They don't have ensorcelled weapons so I guess Chris wanted to improve his composition score with it. It does not mean they are less dangerous as their charge is going to be devastating. With Mark of Tzeentch and Scroll of Shielding they can also survive some nasty spells anyway. And their Blasted Standard will be very useful too, no matter what is going to hit them from afar. Gorebeast Chariots - if regular chariot is bad these are far worse. T6 and 3+ save is really tough to go through for my elves. Fortunately, I have some fast heroes who can hurt these monsters and I will definitely look forward to doing so. They are a little slower than the cavalry so that also can be helpful. But there are 3 of them (or 4 with regular chariot) and that in itself is a problem. Bolt throwers may be helpful but since they are wounding on 4+ it is risky. Searing Doom of course is an option but my opponent knows that and it may be difficult to make it go through. Skullcrushers - another hard hitting unit and there are two of them! Lances again to save some Swedish points but against squishy Elves it does not matter that much. Usually, frenzy can be exploited but with so many units dedicated to Khorne, it may not be that easy. They will be the primary target for the bolt throwers as with t4 I can potentially get one per turn (if I roll well on wounds). Other than that they can be eventually defeated even in combat but that requires good positioning on my part. Chris has some tough army that can steam roll mine if I let it so general plan was to prevent that :) Because the units have different speed I expected slower warriors and knights in the middle of the formation (so that they can waste less time getting to any flank or moving forward, depending on my deployment), crushers on the sides and chariots probably in between. Marauders may or may not be at the back (depends on terrain). Of course a lot depends on the rolls on reinforcements and who is going to deploy first. Even if I were to be the player who does so I would stay away from that army. First, I need to divide it and have more time to weaken it. Second, I can still lose the initiative on a lucky roll of 6 and then I am in even bigger trouble. I also think Chris would adopt tight formation because he does not care that much about flanks and his chariots can always pivot and put me in a dangerous position. I of course planned to use some diverting to mess up with the cohesion of the formation but I will need good shooting and magic to punch some wholes I can later exploit. I wanted to add some discussion on terrain. I find it very important yet very often completely omitted. 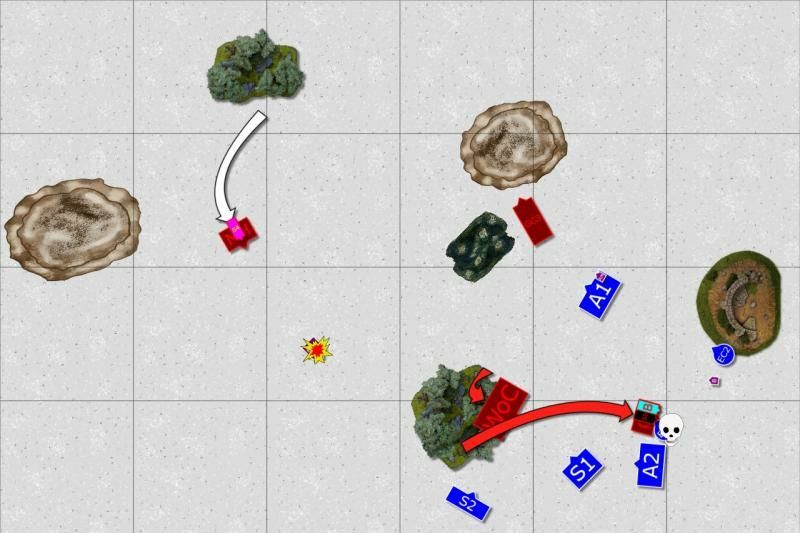 And I have a lot to learn in terms of how to predict where the enemy might deploy his units and how to use that to my advantage. This part is then to try and have a closer look at it and hopefully it will help me in my future games. There are two hills, two forests that are mysterious terrain, a swamp in front of one of the hills and dangerous terrain on the right flank. First, I wanted to have a look at what would I take if I won the roll off. 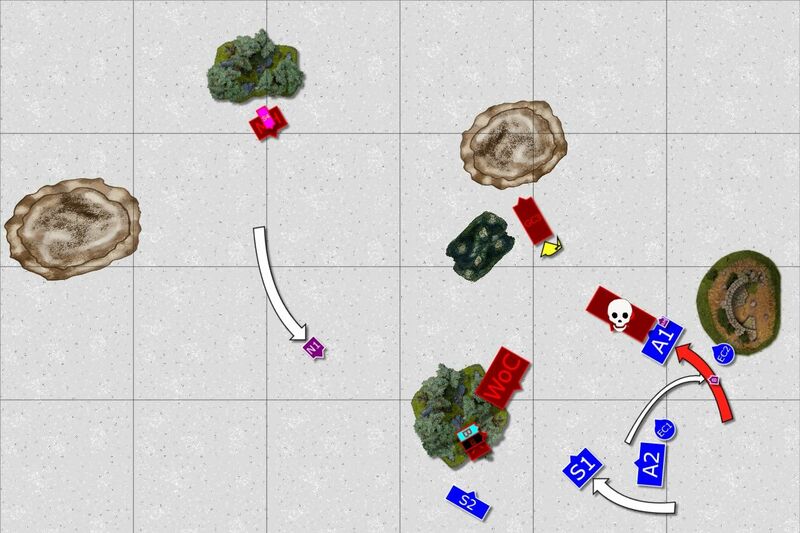 Top right corner was immediately excluded because the hill blocks line of sight and I need clear vision to be able to put my shooting and magic to the best use. I wanted to adopt defensive formation in some kind of a crescent with shooters in the corner and hard hitters on the flanks. From that point of view top left looked better because it didn't have any particular obstructions. The hill could have been used for bolt throwers although it was relatively close to the enemy deployment. However, second hill could have been used for some outflanking and swamp may have been ignored with careful deployment. Bottom left looks empty but that might be an advantage here. 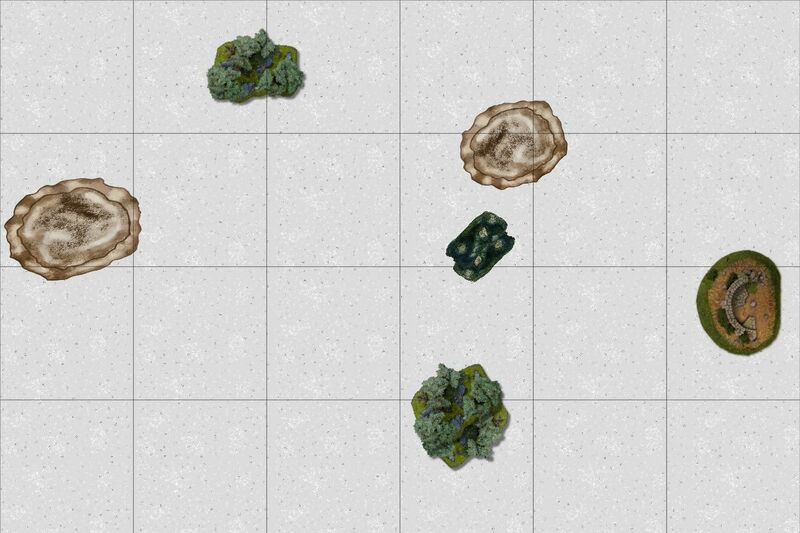 The left hill protects the flank a little against reinforcements, the enemy might need to go through the forests which sometimes may be a dangerous thing to do if they happen to get into venomous woods. Swamp also looks more difficult to avoid or may force the army to be divided which is already good for me. I think that would be my choice. Bottom right was second best in my opinion because it still provided some defensive options (dangerous terrain against chariots is always a good thing to have). Hence, if I were Chris and won the roll off I would probably pick bottom left as that would put Elves in a difficult spot. Either deploy far but limit line of sight or deploy closer and risk combat too early. In particular that he would most likely have the first turn too. 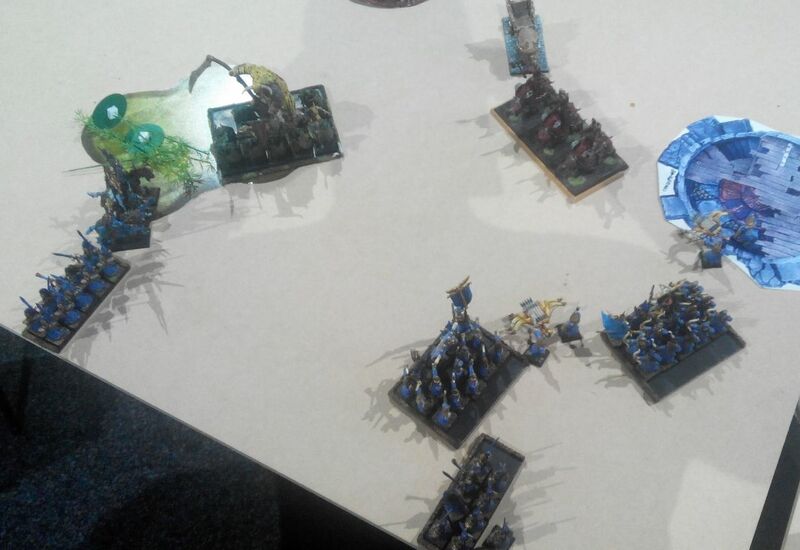 Chris won the roll-off, picked top left corner and deployed his army first. One unit of skull crushers and one gorebeast chariot were in the reserves while on the Elven side Eagle Rider and Reavers were kept in reinforcements. I must admit that on the diagram my army looks very fragile! 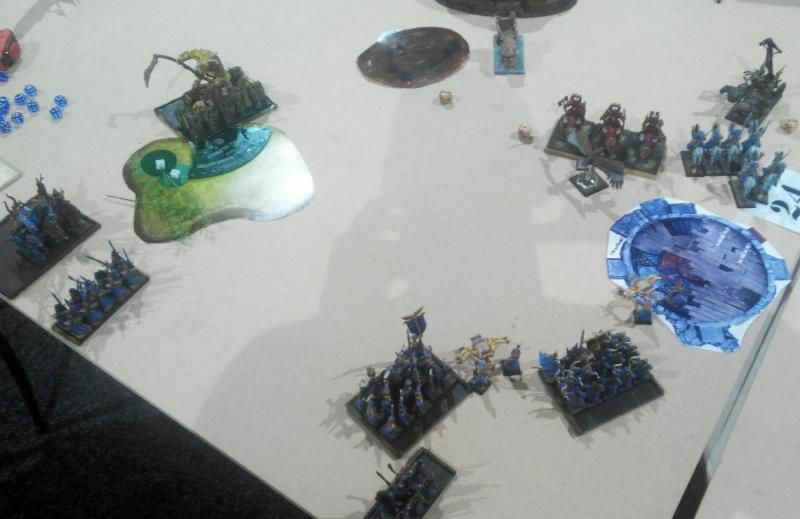 Chris did what he probably should have done without knowing where the enemy is going to be and positioned his army in the middle of the board, as close as possible. I didn't manage to steal the initiative and Chris proceeded to his first turn! Despite one unit of Skullcrushers and one Chariot being in reserves, the order was the same - march forward! Warriors moved in a disciplined way and maintained tight formation. Wrath of Khorne would reach cowardly Elves anyway! Outcasts decided that attack is the best form of defense and charged! Valiant Noble decided to take on a Gorebeast chariot all by himself, won combat but the warriors were not done yet! On the other flank Dragon princes charged another of the monstrosities and were also aided by the reavers. It was probably reckless because the crew killed 3 of the lightly armored riders, despite being under the influence of the spell that slowed down their movements. Elves won that combat but again, warriors didn't want to go anywere. Last but not least the bolt thrower crews aimed at the Skullcrushers and destroyed one of the juggernauts with well placed single bolt. Chaos reinforcements have arrived from the North and it started to look bad for the Elves. First, Chaos Sorcerer destroyed entire unit of Dragon Princes with a single spell. 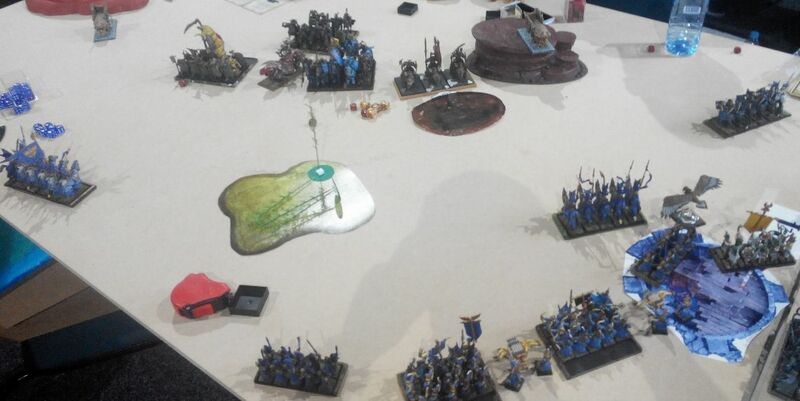 That meant the warriors had no problem with finishing off remaining reavers and gorebeast was free to move although it was not frenzied anymore. The other chariot, however, lost again to the noble hero, who drunk magical liquid that gave him unnatural strength and managed to wound the beast again. He was not fast enough to catch it in pursuit though. Eagle rider arrived too and landed on the left flank to threaten enemy from that direction. Dragon Princes avoided the Warriors but put themselves in the harms way of the gorebeast chariot. Mounted noble chased down the machine that failed to rally and destroyed it for good! Lions, also overcame by the blood rage, charged into third gorebeast and ... could not break it either! 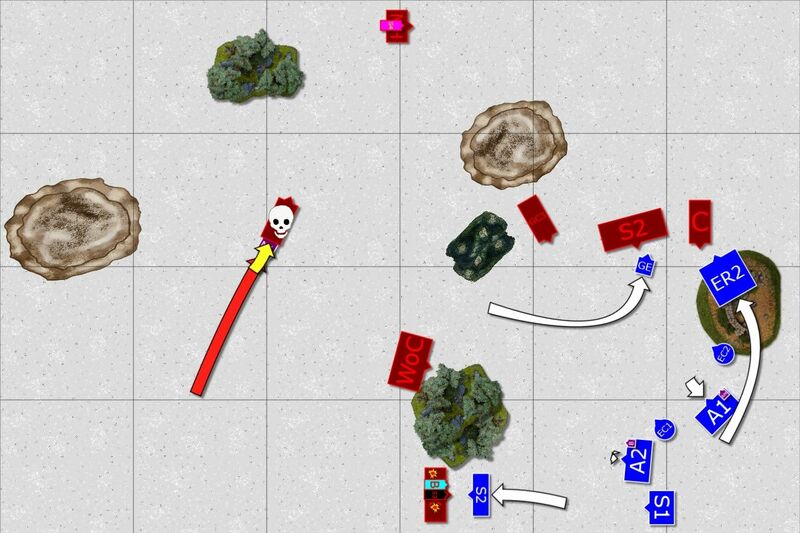 Fortunately Bolt Throwers did their usual job and yet another Skullcrusher was dead. Dragon Princes fled from the gorebeast as planned but their feigned flight was a little bit too enthusiastic and they were spotted by Chaos Knights. Elves were not fast enough to change direction and were caught in pursuit. 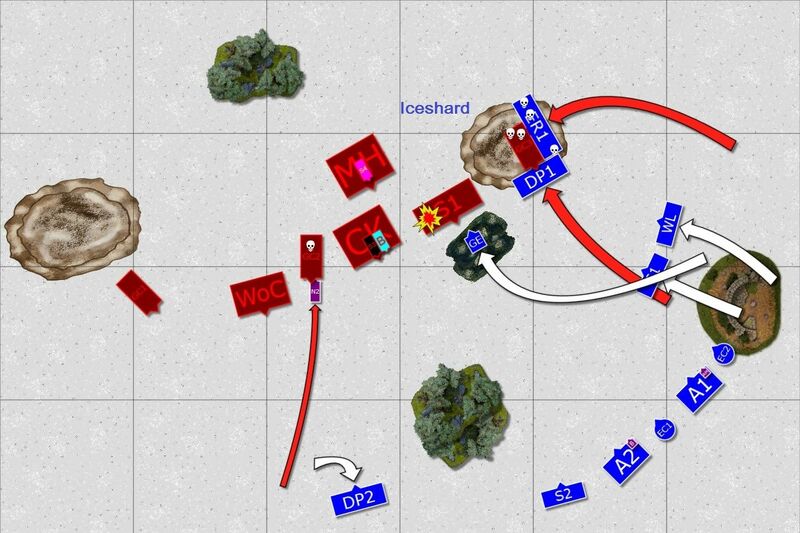 Lions were flank charged by the Skullcrushers but a single warrior survived and held the line for a little bit longer. 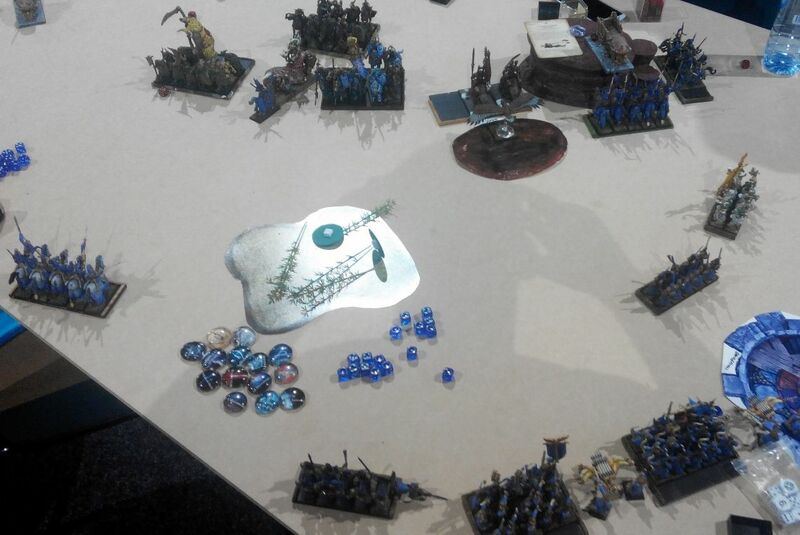 Then Chaos Sorcerer cast his spell that surprisingly did more damage to his unit than to the enemy. The situation looked serious but the enemy was not yet at close range and its army seemed to be divided. Elves took the chance and Eagle Noble attacked yet another gorebeast chariot, broke it but haven't finished in pursuit just yet. Last skull crusher from the first depleted unit was finished though! 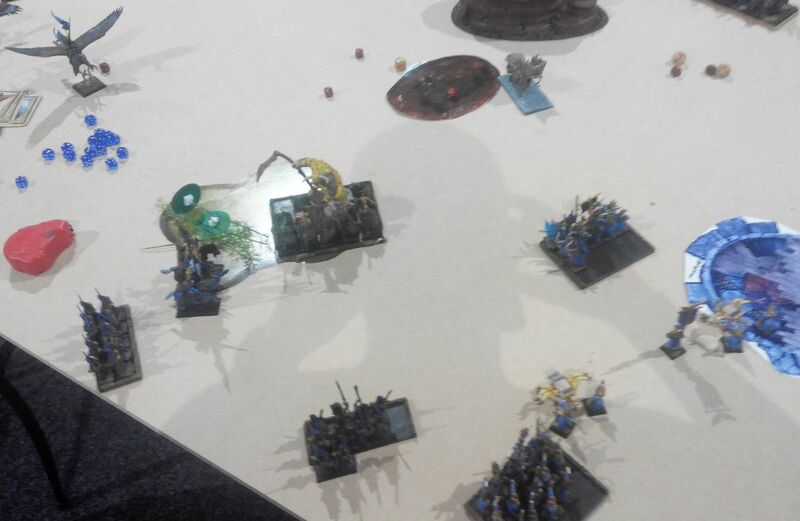 Chaos Warriors charged but the Elves decided it is not yet the right time to do so and withdrew. Would that be enough to buy time to thin the enemy down further? Unfortunately, mounted Noble was hunted down by the vicious Slaanesh Sorcerer. Light troops took one for the team and blocked the advance of the chaos warriors one more time. Eagle Rider finished off the gorebeast at last but was quite far away from the main fight. Is he going to save the day? What are you going to do now, squishy Elves? Skullcrushers took the bait and attacked the eagle. Wounded gorebeast chariot attempted to charge as well but failed. 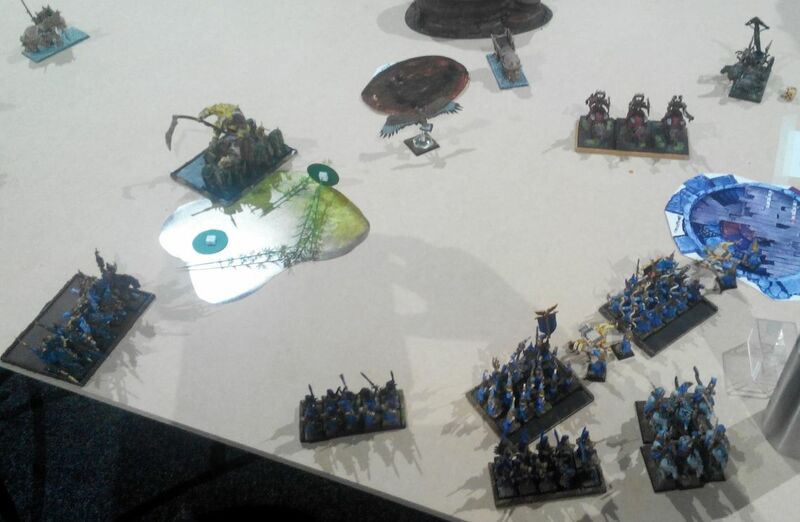 Regular chariot destroyed the Reavers but momentum took it into nearby ruins where it was reduced to splinters! 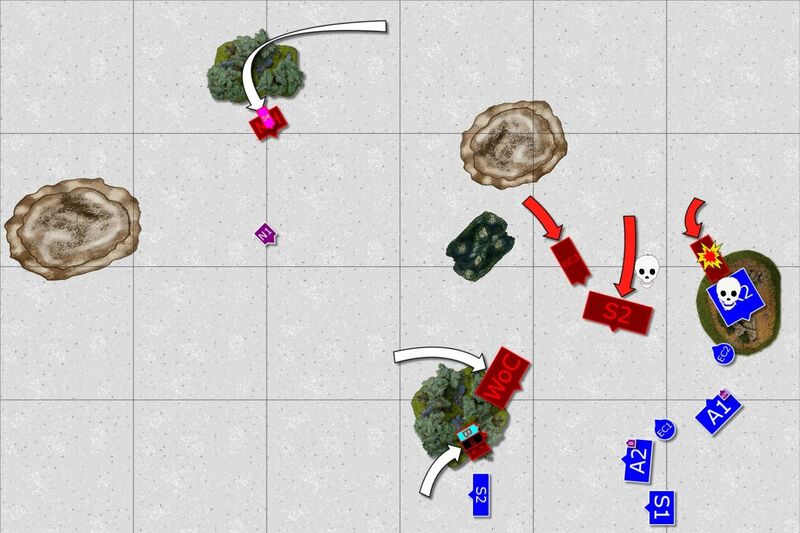 Depleted Knights decided not to take chances against Swordmasters and moved around them and joined forces with the infantry. Archers show their martial prowess! In a bold move the Loremaster led his Archers into close combat against exposed flank of Skullcrushers. Together they destroyed one of the beasts, won combat, broke their enemy and caught in pursuit! That is something nobody really expected! Swordmasters moved to intercept the Knights and enemy infantry. What would they do though? 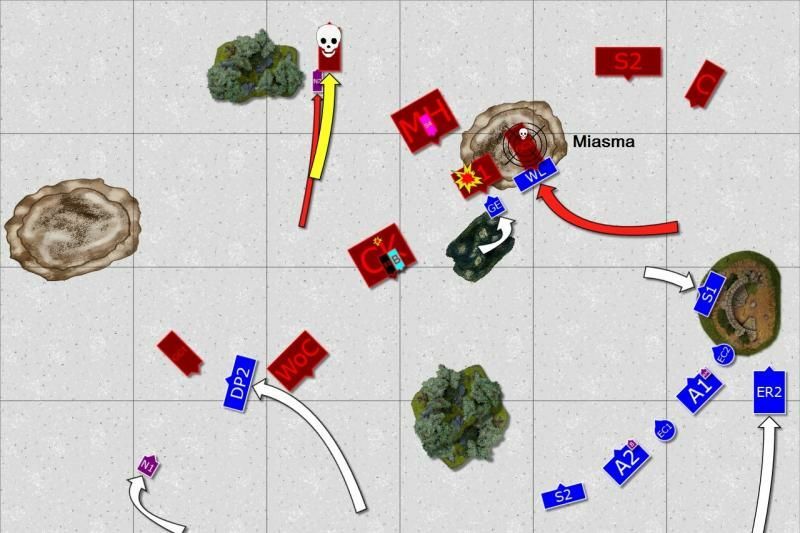 The leaders of the Chaos army decided to go for an easy kill that would lead them away from the enemy elite infantry. They attacked one of the war machines and destroyed it easily. Slaanesh Sorcerer didn't give up either and claimed another victim, this time eagle rider! Only warriors didn't manage to catch the enemy after long march. Last word, however, belonged to Elves. Wounded gorebest chariot was finally put down! Larry the Loremaster tried to reach marauders with his fireball but failed to kill them. 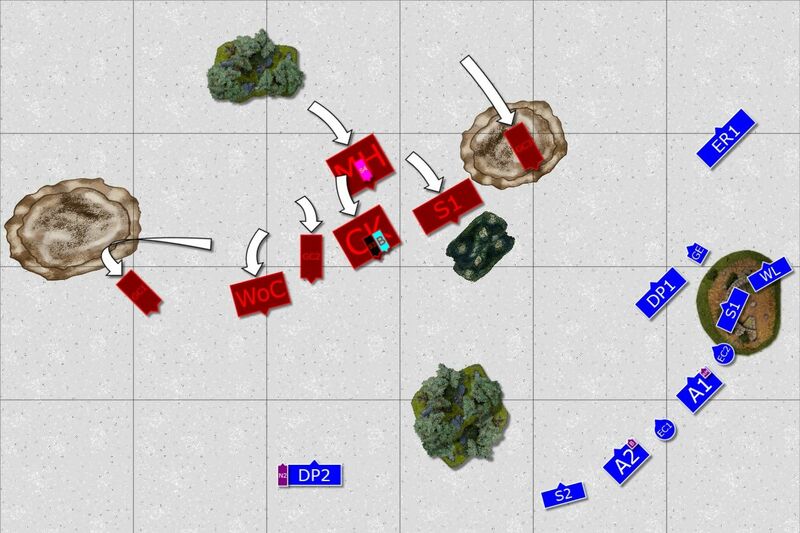 Fortunately, timely attack of Swordmasters brought victory as they cut through the Warriors from the flank, broke them and caught them in pursuit. After blood battle Elves emerged victorious! First of all I would like to thank Chris for a great game! He pushed me hard and he was very close to get me but luck smiled upon me in the last turns! Thanks a lot, Chris! As the composition score was not that different I didn't get many bonus points and in the end I got 12-8 victory which I was very happy about. It was indeed a very bloody battle so I am glad I managed to win against Warriors of Chaos and even did so in combat too! But as always there are things I noticed I could done better, different or simply can think about the alternatives. First of all the reckless charge of the reavers to the flank of the gorebeast chariot was simply a mistake. I didn't bring much to that combat but allowed Chris to swing it better to his favor. With DP's alone I had much better chance to break the chariot as with Iceshard they would have hit me on 5+ instead of 4+ and I also had armor and ward save to factor in. I thought Lions would do better but they failed too (I wonder if I failed fear test) and instead of overrunning into a Skullcrusher I lost another unit. 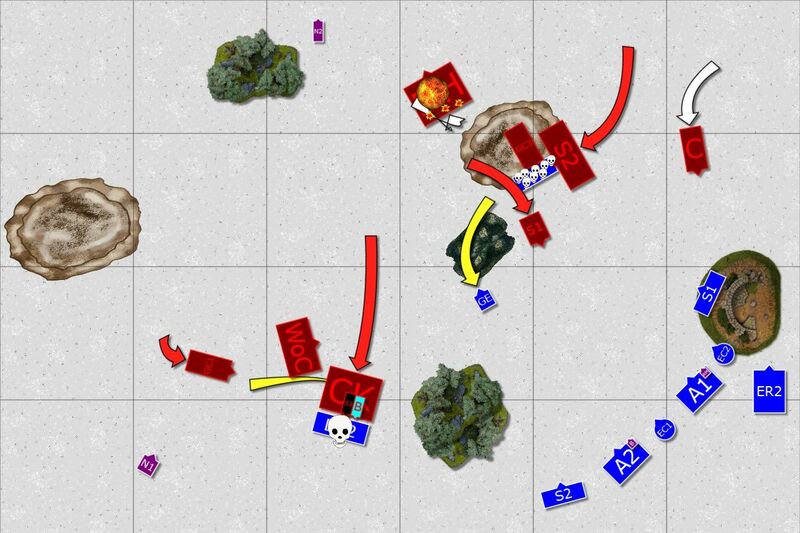 With these 2 bad decisions I lost 3 regiments I needed. I liked the charge with the lone noble against another gorebeast. It worked well as he is well protected and Potion of Strength helped here too. Just a pity I didn't reform him after catching it as it would have put more pressure on nearby marauders. I wonder if I should have charged with Dragon princes instead of using them as a bait. Maybe I should have tried to hold instead? I wanted gorebeast forced to hold the charge against the eagle rider but it was another exchange, especially after I lost 3 regiments already. 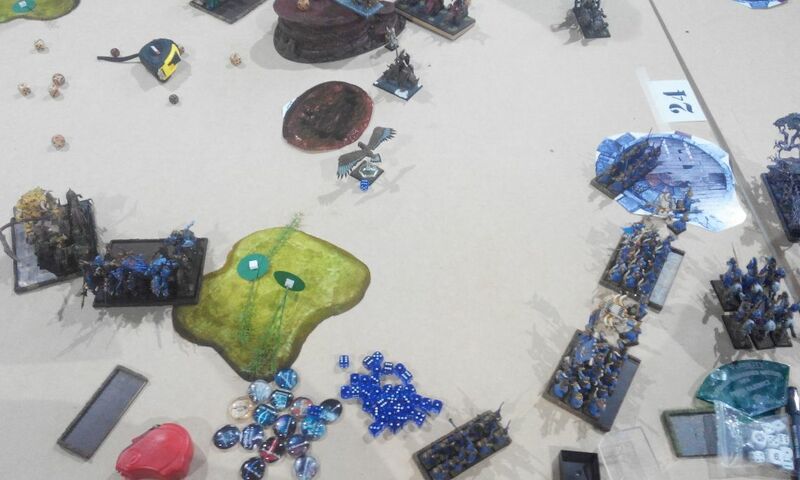 I can't remember which spells I tried against Tzeentch Knights but I think it was Searing Doom as with Blasted Standard regular shooting was inefficient. 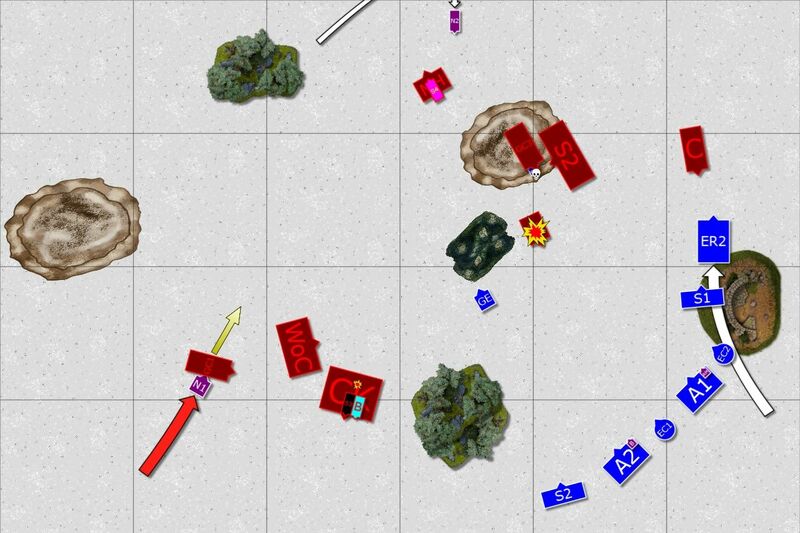 I must say I am glad two bolt throwers destroyed whole unit of crushers too! It was quite unlucky for Chris to lose his Chariot in the ruins but that was my only chance to stop it and somehow it worked. 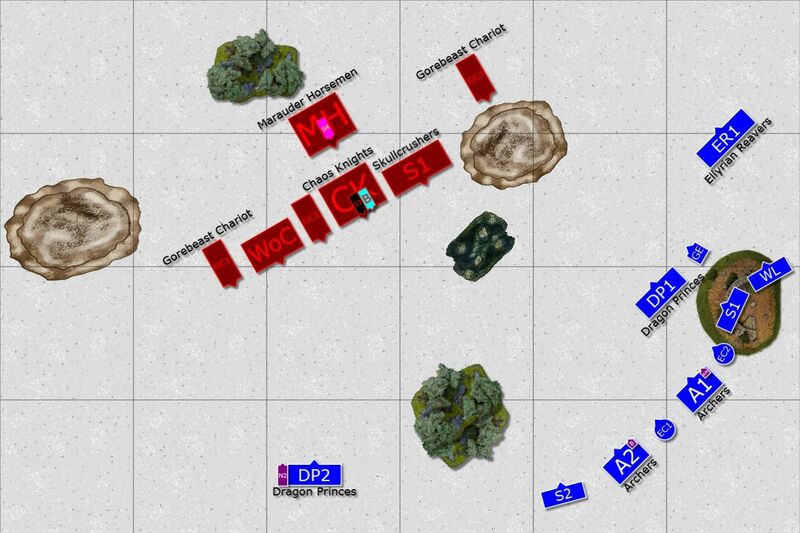 Then two flanking charges that killed two powerful enemy units were just great! These last combats meant that I managed to pull out a victory in the last possible moment.